The ship is probably disassembled, it's not like they have to keep the whole ship the way it was presented. Who knows what they might do with it. 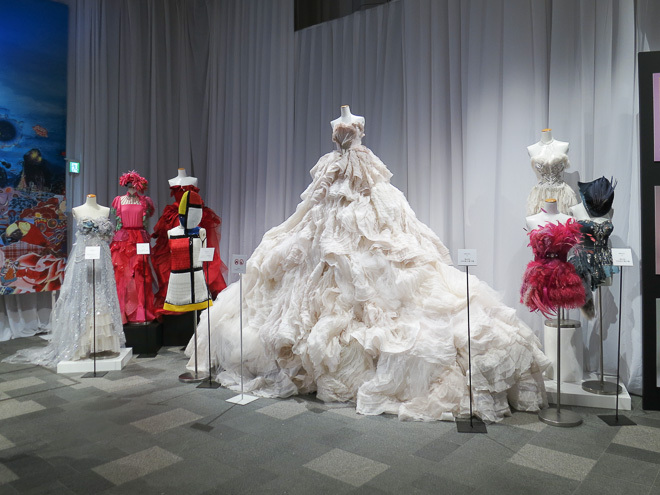 Did Ayu ever had an exhibition of her tour costumes? I don't think I've seen it. She even ditched song from TROUBLE in her "TROUBLE TOUR". I don't see she will bring The way I am and WORDS back in POA3. That red dress from ABL was similiar to CDL07-08 but not the same. Once Ayu was featured in the designer Keita Maruyama's exhibition, remember? With one of the Kouhaku's outfits. ^for sure. I think it’s standard practice for big-name artists. I mean they had Namie’s costumes from back in the 90, even some that looked like regular clothes. Ayu’s have always been specially made to her own specific design ideas, so they definitely have them somewhere. It would actually be an interesting concept to have an Ayu “fanspace live” where you could see the outfits and iconic props, such as the ship. Especially since A Cubed implies third dimension, I.e. stuff you can go see and (theoretically touch) in real life, not just 2D on a screen. Last edited by AJFmzk; 11th February 2019 at 08:23 AM. Ayu recycling her outfits a lot. Dresses from TV shows come to lives and from lives to PVs. So she definetely has some kind of warehouse for them. Yeah... for example that suit from INSPIRE Live transformed to WARNING PV. ^ what do you mean? If you need to pick it up at the venue, just bring your passport + printscreen from the QR that livepocket send to you. Did you receive an e-mail from livepocket? No, sorry if you do not understand. I'm talking about how to contact TeamAyu on the site to warn them that someone else will be taking the tickets. They ask to fill the form with the subject "ticket pick up notification" but I do not see it in the suggested suggestions.Should I put: your request, other inquiries or tickets reservation? . In fact, I have already contacted them (5days ago), but as I have not yet received an answer, I thought that I had not completed the form correctly. Last edited by M.A.X. ; 12th February 2019 at 01:34 PM. So... TA members can choose some (or all?) songs for the tour. Up to 3 song requests by person. I've google translated this but i still have no idea how one can ask for songs on the TA website, how do we do it? I'm not a member of TA, but the info above says through the TA message form. I guess they mean you should contact them by using the message form that appears when clicking on contact at the bottom of the page. At least there is no other message form. actually... avex could just reopen ABL poll site again so we can vote again. Last edited by KLJames; 13th February 2019 at 10:23 PM.